There’s people who use Kickstarter to whip up potato salads, tour Europe as a musician, make the cooler cool again, mass produce X-Wing fighters, or create a Death Star… Sadly, my project isn’t that interesting because I’m the average Joe who relies on the platform to cement a creative voice in comic books. See, I already have a stultifying day job. One that doesn’t engage the mind or my creative impulses, which makes writing comics that much more appealing. Yet I can’t fall back on that dream yet, because I don’t have a voice. About a year ago I emptied out my savings to create Under the Flesh, a Superhero Grindhouse Horror comic that features a short-tempered super soldier with a machete taped to his hand, named Ruben Lobos, who looks to protect the weak in a post-apocalyptic world ravaged by an unknown virus, which ONLY infects males, degenerating them into savage cannibals! Judging by the title, don’t assume that Under The Flesh is standard zombie fare, although undead horror fans will find lots to love about UTF, we’re hoping the direction of the comic will appeal to all fans in general, especially those who crave a good superhero story. UTF aspires to be different although it’s a calculated mashup of familiar themes. The perennial example of what defines creator-owned comics. I’d love to tell you more, but I’d rather have you see for yourself and gauge the quality of the comic by making it available for you to download our first issue totally FREE! Now that’s where Kickstarter comes in! My first campaign was a success and I was able to print the fully completed 1st issue as well as finance the art for UTF #2, which is drawn by the maestro himself: J.L. Giles, the project’s inker, colorist, and letterer! The gifted hand behind my brainchild! JL and I are committed to putting out our best work with UTF, and as a two-man team without an editor, we’re constantly challenging each other to keep this comic as engaging as possible. Simply put, KICKSTARTER is our lifeline. Without our crowdfunding backers, Under The Flesh doesn’t exist. Simple as that. My creative voice in comics is nothing but a hopeful inaudible whisper amongst a vivacious bustling marketplace. I would love nothing more than to continue writing comics, but that solely depends on whether others willfully choose to aid in projecting my creative voice past that of a hopeful whisper. We’re at 50% of our goal with just 5 days to go! There’s cool rewards for pre-ordering UTF #2 like sketches, your likeness being immortalized in our universe as a flesher, Hellion Biker, and more! Please check out our Kickstarter and consider lending some support! A Tweet, a Like, a dollar, or even spreading goes a long way for creator-owned and Indie comics! I’m nothing without you! I am a very big fan of the Zombie genre and The Walking Dead is one of my favorite comic books. I would watch George A. Romero’s Night of the Living Dead as much as I could and couldn’t be happier when the sequels were released. So, when any kind of Zombie story comes out I gravitate towards the media like a kid at…well…a comic book store. One day, surfing the web, I came across some really cool art and discovered Under The Flesh, a zombie story still in its infancy with incredible characters and a great premise. In Under The Flesh #1 creator and writer, Gilbert Deltres, introduces the characters of this bleak new world in a manner that best displays the core team of survivors being lead under Lt. Ruben Lobos. Lobos is an elite soldier injected with cell-fusing nanobots that battles viruses while enhancing physical strength and cognition. On the day he was injected, appropriately dubbed ‘Desolation Day’, the world succumbs to an unknown pathogen that only infects the male population. He flees the infected with his jealous girlfriend, Dinah, in tow. They end up with the rest of the cast at a local library for safety as the issue begins to heat up. We don’t learn much more about the Lieutenant’s superhuman abilities, but only issue #1 has been released so far with a KickStarter project already underway this month and more of the story coming out soon. What made this comic stand out is the fantastic art by J.L. Giles. What initially caught my eye was his incredible action scenes that made me feel immersed into each panel and sequence. The expressions on each of the character’s faces are expertly drawn to give you a better understanding of their trials and misery. The tagline reads that governments crumbled, global military powers wiped out, and societies demolished and all of that is masterfully conveyed in Giles illustrations. I especially enjoyed the landscape scenes that made each page come to life with the perfect use of shades of purple and blue. In the world of comic books it is extremely difficult to get your work noticed and seen by a large audience. Independent writers and artists have an extremely tough mountain to climb unless they create an amazing story with interesting characters and imaginative illustrations that bring life to the narrative. The creators of the comic book Under The Flesh, Gilbert Deltres and J.L. Giles, have done just that and more. The writing and art harmoniously come together to deliver a comic that you just can’t stop reading. 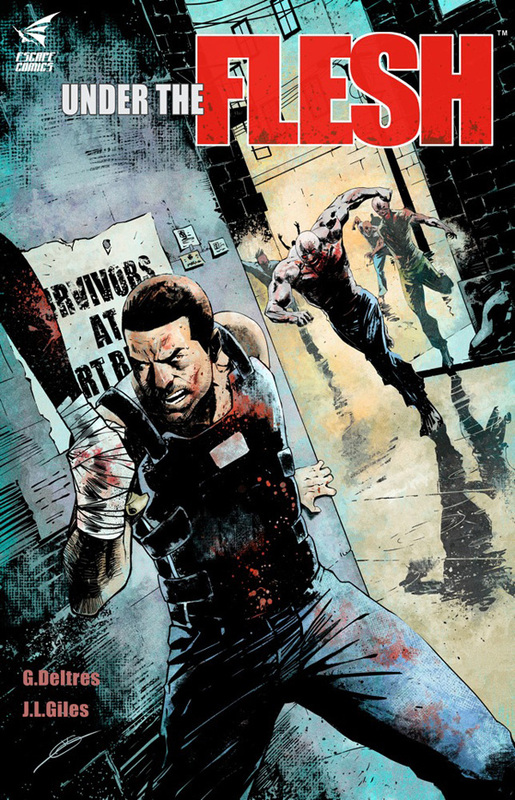 And with Issue #1 available and a KickStarter project underway hopefully we will have plenty more of this story soon to satisfy the Zombie killer in all of us.